AutoProof Pro™ Color is a color comparison and sampling program designed to compare a target color between two files. AutoProof Pro™ Color loads a master or reference document then compares the color against a sample document. Using the flexible alignment and overlay tools, operators can simply superimpose two regions of interest then compare. AutoProof Pro™ will display the comparison results between the reference color and the target color. Though non-calibrated, relative color values are determined to see if the target article falls within acceptable parameters as compared to the reference file. This easy to use system can compensate for printing techniques, such as color half-toning and vignetting, and will produce a comparison report listing reference and target color values for specific locations on inspected document. AutoProof Pro™ Color is a part of a modular system integrated within the AutoProof Pro™ Imaging Suite collection. 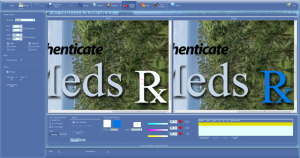 This collection is 21 CFR Part 11 compliant and features a repository for storing all color comparison projects allowing for easy recall and processing.